As the Small Batch Coffee empire stretches out across Brighton & Hove, I keep finding myself unable to write columns quickly enough. It was not long ago that new outlets of this highly successful local enterprise opened on Wilbury Road and Jubilee Street in quick succession. A branch on the Seven Dials roundabout has just opened and an extension to the Goldstone Villas roastery is hot on its heels. The new Seven Dials outlet is situated in a building that was once home to Barclays Bank, but recently vacated by a bar called Xuma. The building actually consists of what was originally a fairly standard Victorian end-of-terrace house and its large Edwardian ground floor extension of 1902. The extension features an open-topped pediment, fluted Ionic pilasters and egg-and-dart ornamentation. The Black Spread Eagle of Barclays has been etched onto the glass of each of the two main entrance doors. The ground floor, basement and much of the exterior have been given a thorough makeover by my friend Paul Nicholson of Chalk Architecture. A Corten steel worktop is perhaps the centre-piece of the airy main area. This is surrounded by a scattering of Chalk’s bespoke coffee shop range of solid oak stools, and custom-made tables and counters. A new addition is a matching chair which, like the others, features the Small Batch dome logo. The walls are lined with lots of reclaimed oak and a number of ‘antique’ mirrors (which have been aged with old teabags). The oak has been deliberately charred black in places. Paul says that is an allusion to the way in which timber was once treated on barns around Sussex. I think that he just likes burning stuff. Regular readers know that I am a huge fan of the subterranean which explains why much of my visit to Small Batch was spent in the basement or, more precisely, the old vault. 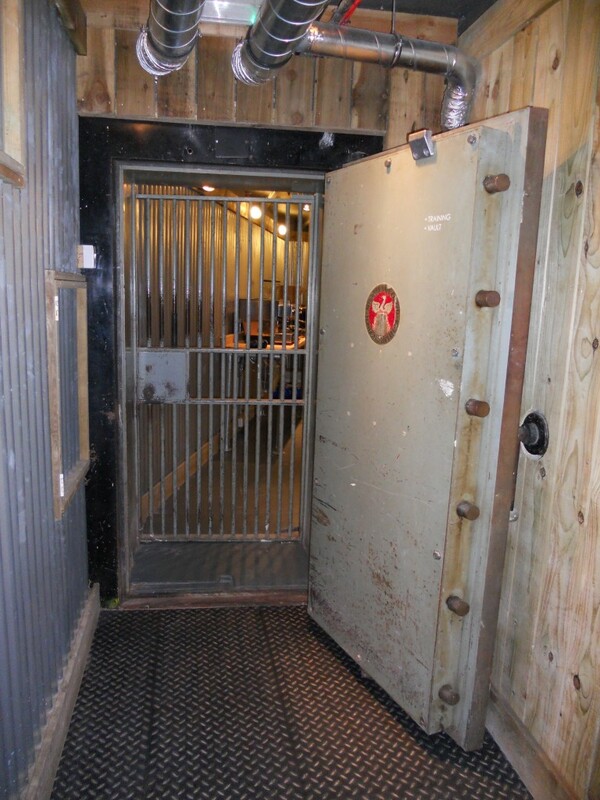 A long corridor in the basement leads to an incredibly thick steel door which guards a large room with thick concrete walls, floor and ceiling. In turn, this leads, via another thick door, into a smaller room where the cash was once kept by Barclays (and the bottles by Xuma). Each has been given the Chalk treatment and will soon be used as training areas. 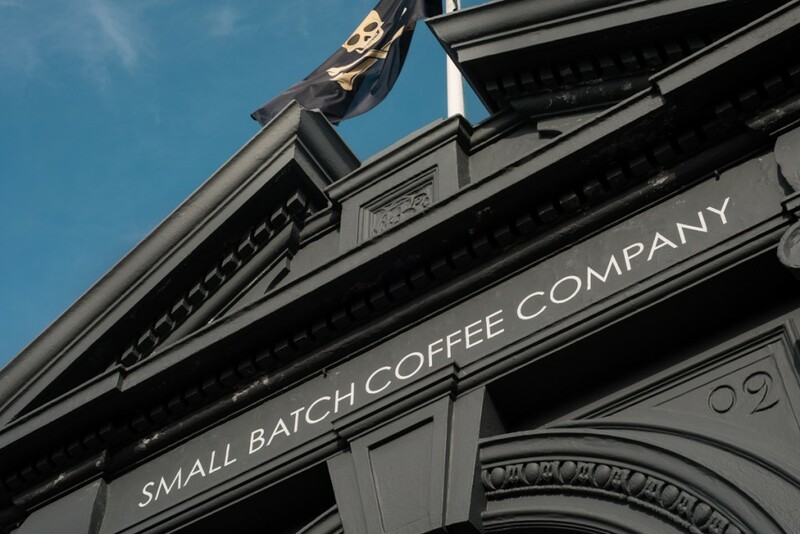 I do happen to like the coffee at Small Batch but, if I didn’t, I would certainly go for the architecture. I know all too well that Brighton & Hove has its more than its fair share of subterranean spaces. I’ve had a lot of fun in exploring its plethora of cellars, tunnels, arches and reservoirs over the past ten years. But this did little to prepare me for the labyrinthian tunnels beneath Reims. Reims is the largest city in the Champagne region in the north-east of France. It is home to a number of the most famous champagne houses including Louis Roederer, Piper Heidsieck, Taittinger and Veuve Clicquot. 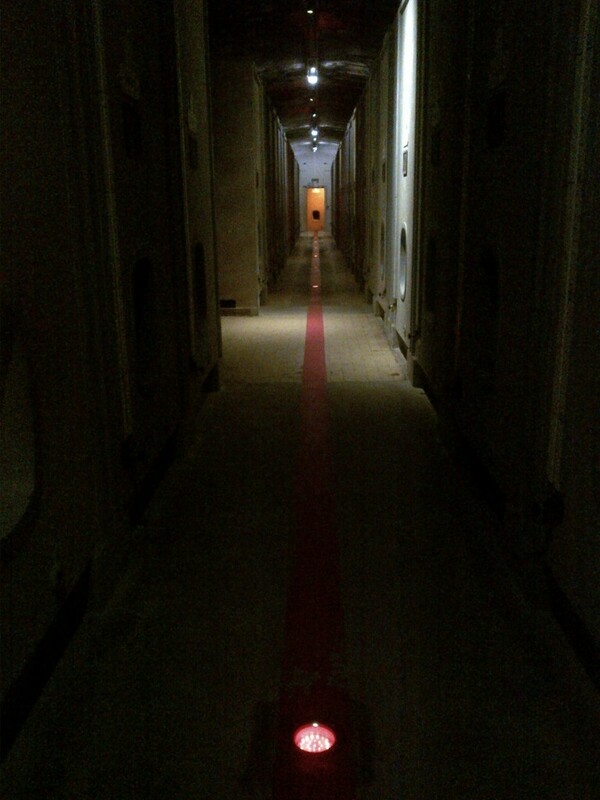 I was lucky enough to partake in a tour of the vast hidden tunnels of G. H. Mumm, the Champagne house that is well known by all F1 fans. Mumm was founded in 1827 by three German brothers from the Rhine Valley. The family kept their German citizenship which actually led to their property being confiscated by the French during the First World War, despite their huge contribution to France over the previous century. Upon arriving at the Mumm estate, which is characterised by a series of attractive low-rise classically-inspired structures, we were shown into a generous reception area and then quickly ushered into a small cinema for a film about the firm’s history. We then descended a slim staircase into the first basement level. At this depth, the various rooms and passages were stone-lined. A cheerful tour guide gave insight into how the grapes from the various fields which are owned by Mumm are turned into world-class champagne by blending, fermenting and cleaning. Our knowledge of champagne bottle sizes was put to the test (I got stuck at Nebuchadnezzar). The cellars at this point were unexpectedly cavernous, but nothing compared to what came next. A tight spiral staircase took us down into a maze of storage tunnels that snake out beneath Reims in every direction. 25 million bottles are stored in the 25km network. One tunnel was 1km long. At this depth, the tunnels had simply been carved out of the chalk. A constant temperature of 11˚C and humidity of 85% are perfect for the purpose which they serve. 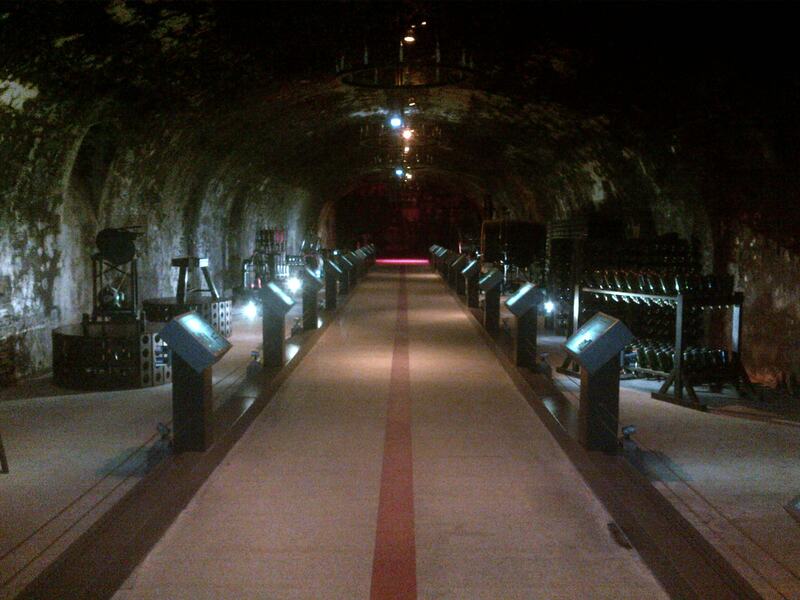 Some of the tunnels beneath Reims date back to Roman times though those of Mumm are not that old. It is fascinating that the historic buildings and tunnels have been integrated, side by side, into such a slick modern operation. The ‘CAVES’ button on a sleek steel elevator really hit this home. 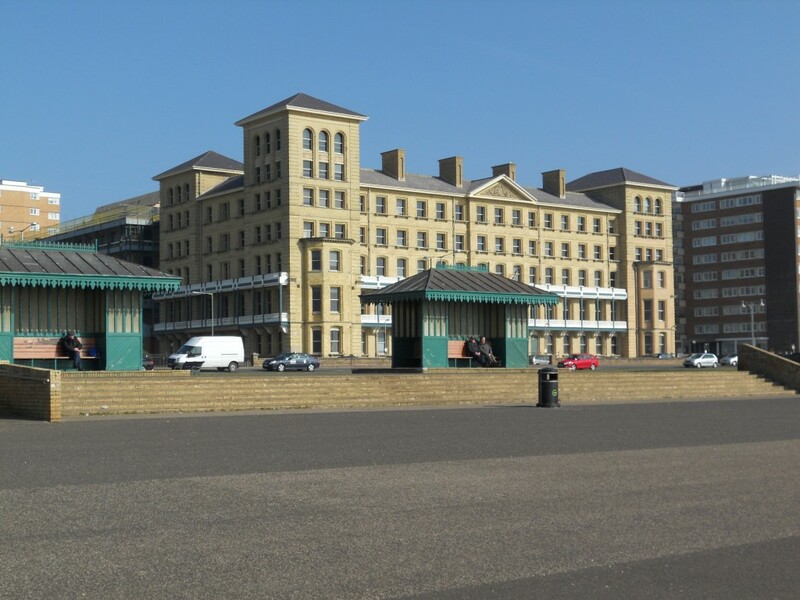 A planning application for a plinth on King’s Espanade on the Hove seafront is to be decided next month by Brighton & Hove City Council. The idea for a 2.5m high stone-clad plinth sprung from a conversation in the queue at the nearby King Alfred Leisure Centre between Helmut Lusser and Peter Seddon from Hove Civic Society and Sussex Public Sculpture Recording Project respectively. If approved and completed, public works of art will grace the plinth much in the same way that Trafalgar Square’s Fourth Plinth has operated in recent years. Hove Civic Society will own, and presumably manage, the plinth but it will stand on public land. An outline agreement was made with the council on this point in January which means that the first hurdle has been cleared. Planning is likely to be a little trickier. The plinth is to be situated right in the middle of the promenade and lined up with the centre of Grand Avenue. 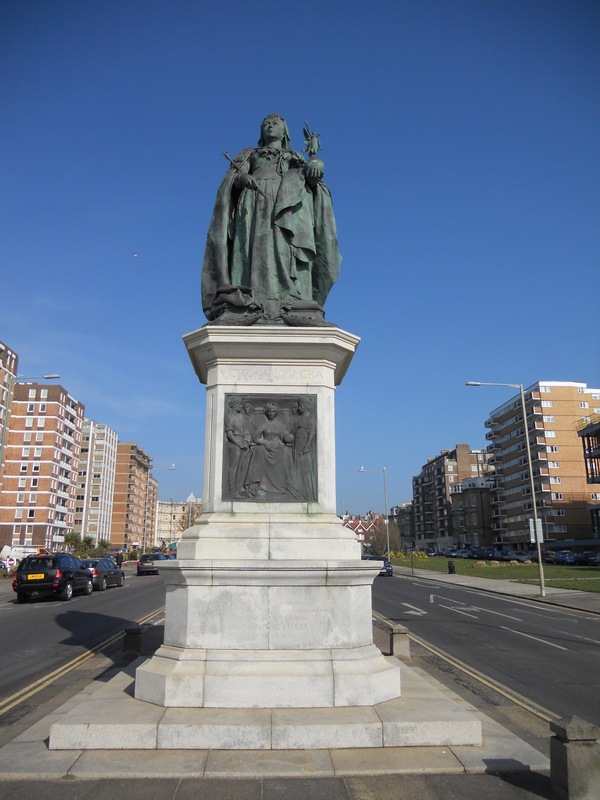 It will therefore be on exactly the same axis as the bronze statue of Queen Victoria of 1901 and Hove War Memorial, by Sir Edwin Lutyens, of 1921. I discovered that a not so pretty black bin on the promenade lines sits on this line as well which is why I have not provided any centralised images from the esplanade. It looked like a bin anyway. It might have been a piece of modern art. Brighton-based design firm Millimetre is responsible for the rather attractive design of the plinth. The materials will be Nabresina stone, which is like Portland stone, and concrete. This will help it to cope with sculptures and art installations that weight up to 11 tonnes. Although it is to be traditional aesthetically, there will be gadgets galore. Fancy lights and even sound and motorisation bring the classic plinth into the 21st Century. A number of letters of both support and objection have been received by Brighton & Hove City Council already. I am inclined to support the idea. It will slightly obscure views along the open esplanade but, if all goes to plan, the art will more than make up for it. Hove Civic Society’s Karin Janzon told me a little about the charity’s plans for funding the project. Many arms will need to be twisted to raise the £50,000 that is required. Hopefully this will include a small sum to move the aforementioned offending bin. Exeter Street Hall was a hive of activity when I visited. The building and the surrounding streets of Prestonville were covered in a thick layer of snow, which meant that sodden coats were drying all around the building. But, most importantly, the all-important deadline of 31st January 2013 was approaching fast. St Luke’s Church was built in 1875 on the Old Shoreham Road. St Luke’s Church Hall – known fondly as Exeter Street Hall – was built around the corner nine years later, as confirmed by a ceremonial foundation stone on the building’s red-brick façade which was laid, presumably when construction was completed, on 6th May 1884. 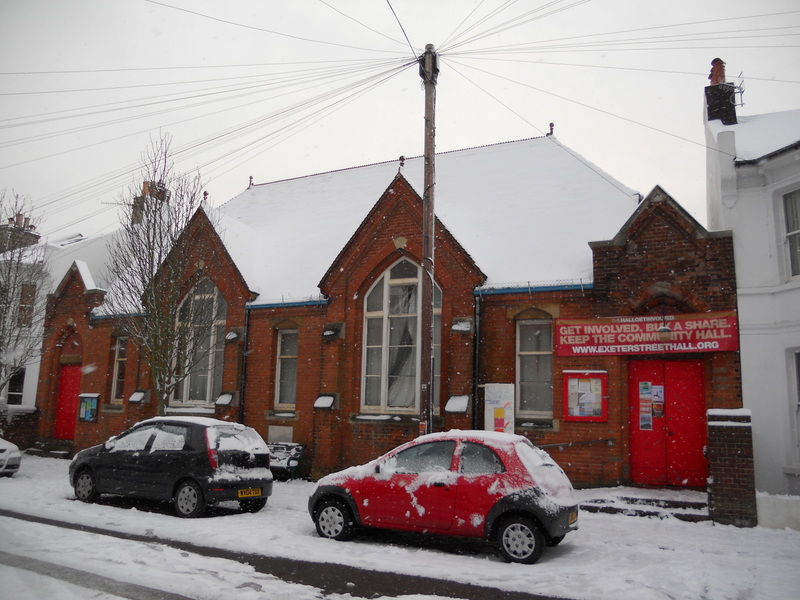 It was at the end of 2011 that residents of Prestonville were informed by the Church that the hall was to be put up for sale – and soon afterwards that a community campaign sprang up to purchase the building for the public good. £200,000 was to be raised by selling shares to anybody who wanted to chip in. Hundreds of people got involved. But the deadline was tight and it was an awful lot of cash to find in such a short space of time. I was shown around by campaigner Peter Golton, a resident of Exeter Street (and physics teacher at BHASVIC), who introduced me to Paul Winter who got the whole operation going in the first place. Leaflets were being batched, banners folded and lists checked. It was a highly-organised chaos in the kitchen behind. The front of the building consists of the main hall, which is situated between separate entrances for boys and girls. These doorways presumably date back to the original Sunday School. A multitude of gables (I counted ten) and medieval-themed fireplaces clearly define the building’s style as Gothic. 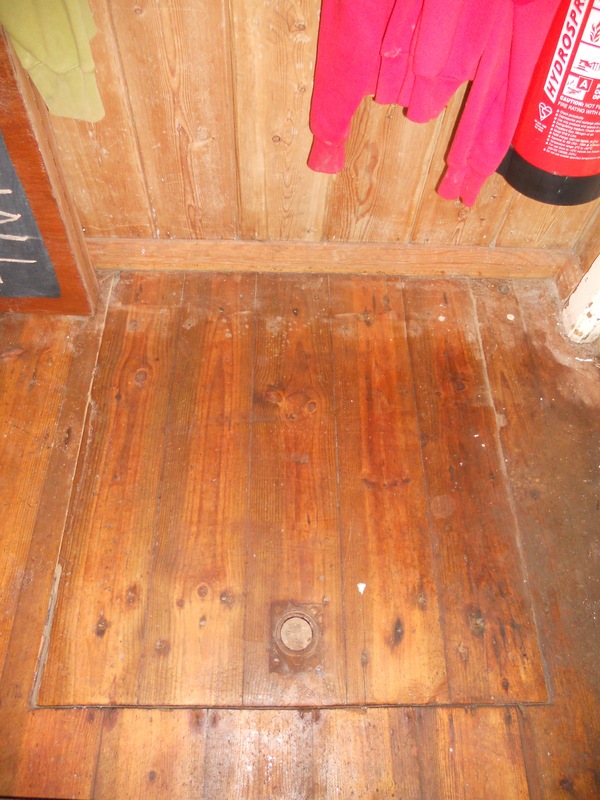 A trap-door in the floor close to the boys’ entrance was simply dying to be lifted. It came up fairly easily, at which point a small crowd gathered to see what was below. It had clearly been explored before by successive tradesmen as electricity cables and gas pipes can be seen zigzagging across the cavity below. It is fairly deep though and itching to be navigated properly. When I visited, an impressive £138,850 had been raised with only around one week to go. A flood of last-minute share applications, and a £50,000 reduction in the selling price, meant that the hall was saved. Visit to www.exeterstreethall.org to see what is planned.